On February 7, 2007, the Purple Foxes were on active-duty in Iraq. 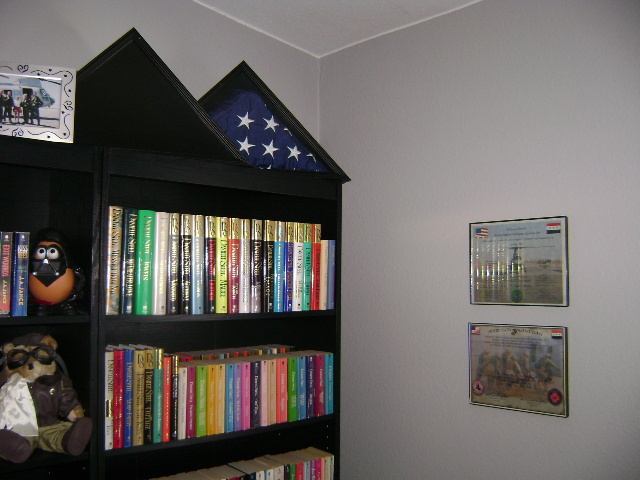 I asked for a flag to be flown this day, the 38th anniversary of my father's crash. 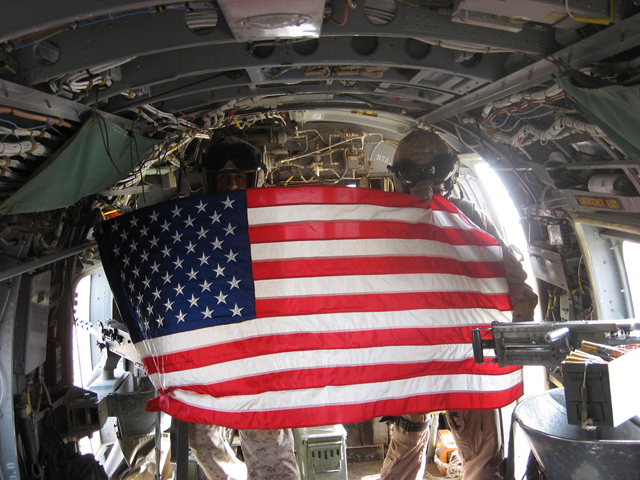 Unbelievably, the helicopter that was carrying this flag - piloted by Capt. Jennifer Harris - was shot down by insurgents. The flight was Morphine-12, and while I received the certificate of the flag being flown, the flag was lost with the crew. After the Morphine-12 crash, I knew I would never ask the Foxes to fly another flag for my dad and his crew. Unreasonable and superstitious, I know. But that is how I felt. Unbeknownst to me, on Memorial Day, 2008, the current C.O. of the Foxes and a crew flew another flag. They didn't tell me, knowing I would have put a stop to it. 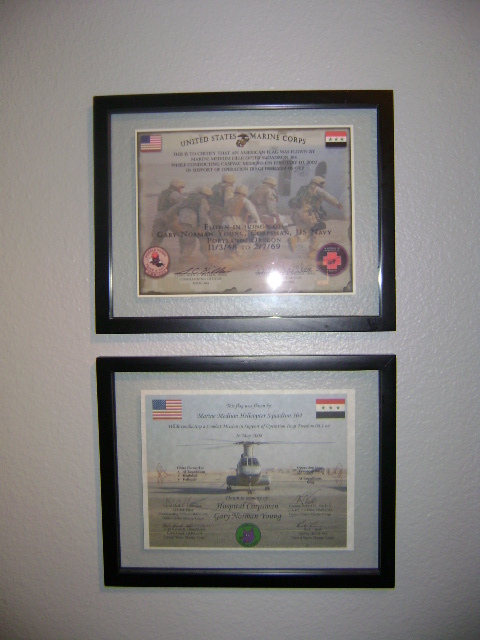 I received the flag and certificate a few weeks later, but wasn't sure how to display them. Thinking of the missing man formation, I came up with the display shown in the attached pictures. 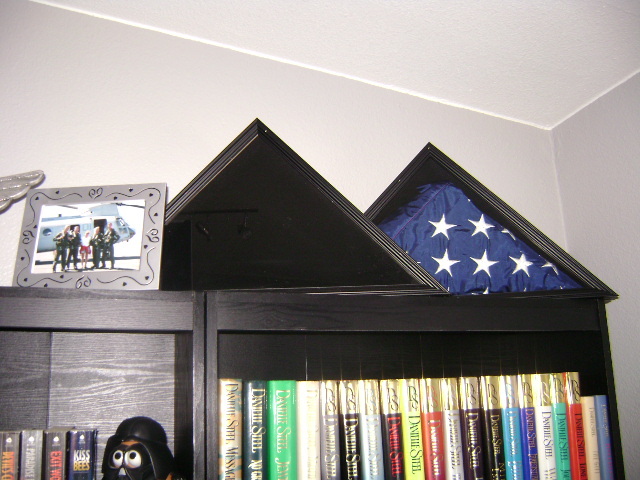 One empty flag holder, one with the Memorial Day flag, and the 2 certificates. Just another way I will remember two generations of heroes tied together forever.